For each critical task that I need this individual to complete, I identify 2-3 specific behaviors that they must consistently practice in order to be successful. Then I will ask them behavioral interview questions to see if these are behaviors that they have consistently and effectively practiced in the past. Why do I do this? Because past behaviors are the best predictor of future behaviors. Tell me about some recent experiences you’ve had with answering the phone and discovering that the caller was angry or frustrated with you or your company. Tell me about the angriest customer you’ve ever had to deal with on the phone, and walk me through how that conversation went. Tell me about ways you helped solve problems for your customers or team members in the past. Walk me through each of those situations in detail. By drilling down and gathering lots of detail about their past behaviors in similar situations, you can observe indirectly exactly how someone behaves in the tasks for which you are hiring them. Also, by gathering lots of detail, you can spot inconsistencies or potential fabrications to press into or back away from. Next, I seek to know how self-aware this person is and how well they make decisions based on their self-awareness. This can be accomplished through carefully crafted questions as well as tools such as the DiSC Profile or Myers-Briggs. You can also gather good information through references if you plan your reference questions well. Does this individual have a good awareness of both their strengths and weaknesses? Are they forthright with that knowledge? Do they use that knowledge in their daily work practices? Is how I am experiencing this person at this moment consistent with what they are telling me? My experience has taught me that it is not our weaknesses that create the biggest problems for us. It is our blind-spots. If we have good self-awareness we can always find effective ways to grow or compensate for our weaknesses. But a lack of self-awareness will always create undesirable outcomes. Are they a learner? What new knowledge have they taken the initiative to gain recently? What new skills have they learned? What do they hope to learn in this new job opportunity? What do they hope to contribute? As I coach executives and managers these are the kinds of conversations we have. 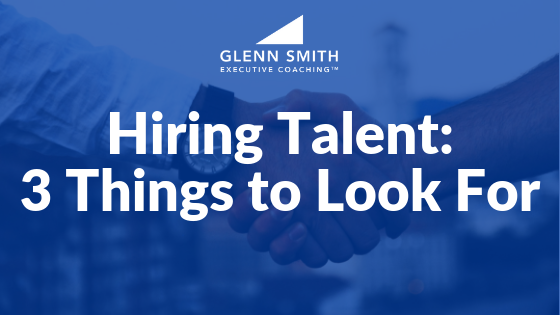 Hiring and developing talented people is one of the critical components of your success. By gathering the data you need in these 3 areas you will be able to make very wise and beneficial hiring decisions. As an employer, how do I know if this person I'm interviewing can really do the job? 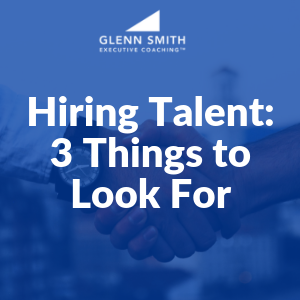 Here are 3 things to look for when hiring talent.